Transforming Kids initiate the human development of children from the age of 4 – 14 years old, by helping them to become spiritual champions. Our strategy is to build a spiritual foundation that serves as a base of children’s human development through character development programs, based on biblical values. With this product, we want to enable our partners to engage in the process of transforming children into spiritual champions and develop a partnership between parent, churches, schools and ministries to raise God-loving and God-fearing children – children with character who shows love to others. A well-know researcher once said: The longer you wait to pursue influence, the more difficult it is to counteract the influences of other parties that have imprinting their values upon their children” George Barna. Human development is a complex mixture of growth in five core areas: the moral dimension, spiritual dimension, physical dimension, emotional dimension and intellectual dimension of life. The basis of each of these is one’s spiritual foundation. The outcomes of the spiritual foundation is measured against some fo the critical characters traits we are looking for in a child’s human development: Honesty, kindness, gentleness, reliability, encouragement, mercy, discipline, compassion, patience, self control, consistency, humility, maturity, trustworthiness, love, respect, joy, loyalty, perseverance, justice, stability, sincerity and forgiveness. 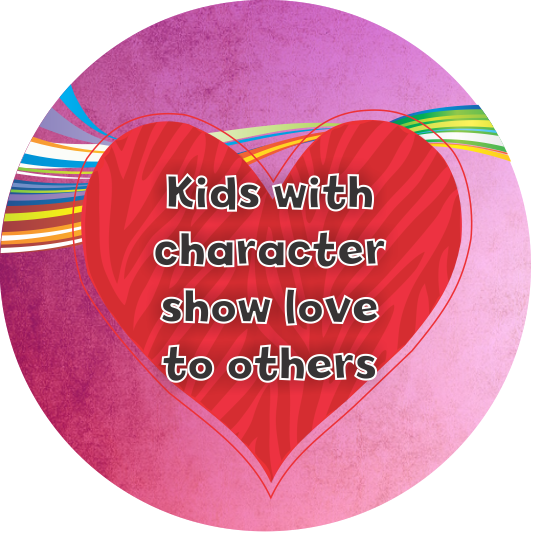 In the first issue in the series of “children with character” (Children with character – Love) we focus on 9 of these very important characteristics: Love, patience, compassion, humbleness, kindness, honesty, self control, forgiveness and respect. 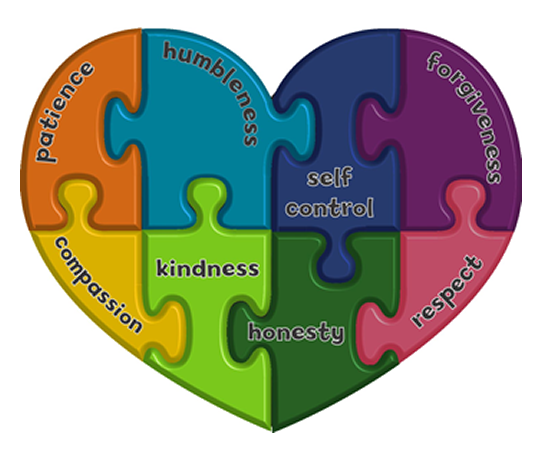 Love, patience, compassion, humbleness, kindness, honesty, self control, forgiveness and respect. Every school and community strives to be a values driven school and community. 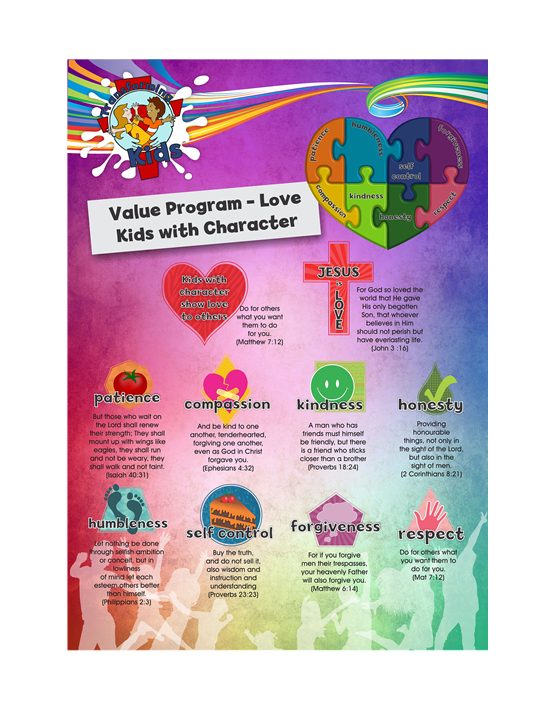 This Values Program is based on 1 Corinthians 13:1-7. 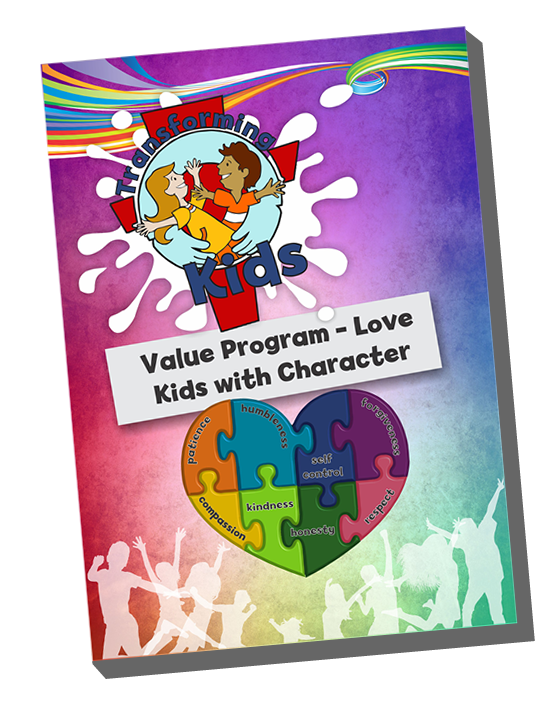 The theme of the program is “Love”with eight main characteristics that we need to love God and to love our fellow man – Kids with Character show love to one another. This program is presented in collaboration with the staff, youth workers, community leaders, governing bodies and parents of the school. The aim id to re-establish a lifestyle of “doing to others what you want them to do to you” within the children. The program focuses on teaching the children a set of central values based on the Word of God. This is why this window of opportunity can only be of great benefit to your school community. Our departure point is 1 Corinthians 13. We know that this precious scripture is a clear guideline for how our Heavenly Father want us to treat our neighbour. A new value is presented to the children every month and then they are consistently motivated to implement this value daily and it part od their lifestyle. Ideally parents will also set a living example of this value. 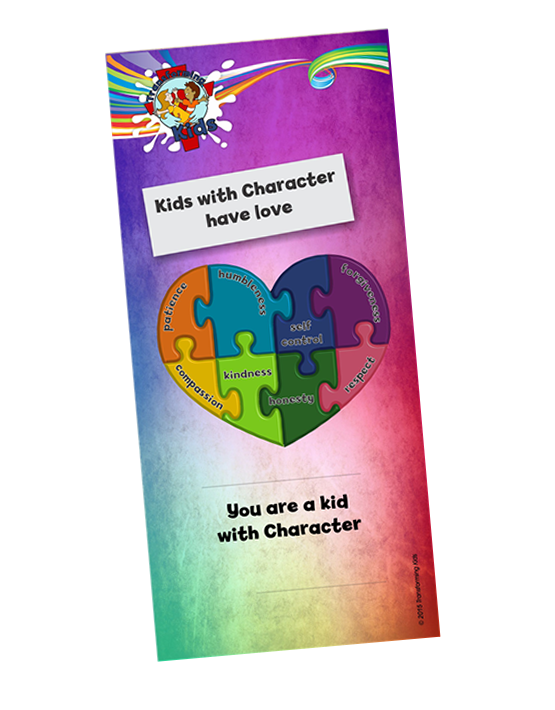 Ideally the same value presented at the Kids with Character session will be reinforces during assembly, base classes and at home, This requires the co-operations and support of every parents and teacher, without adding any additional burden. 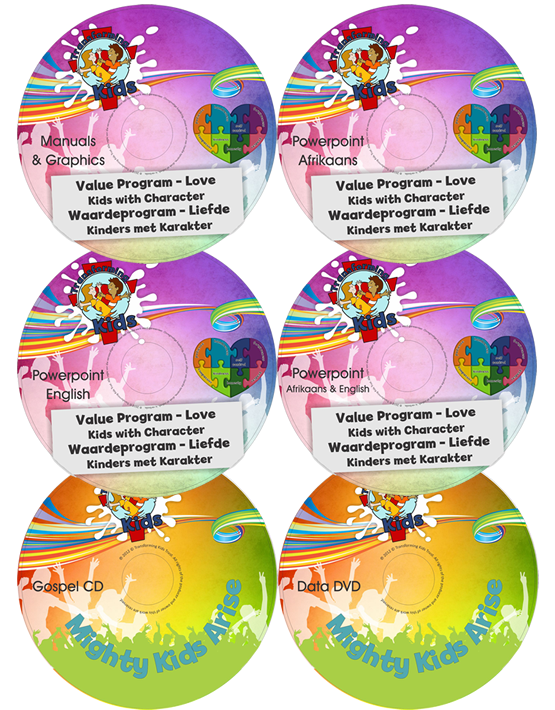 The Value Program is offered with full interactive “PowerPoint” presentations (20 in total) in Afrikaans and English, with praise and worship songs, motivational videos, in-depth information about the main characteristics of the value and weekly encouragement. All graphical representations are also included in the package. 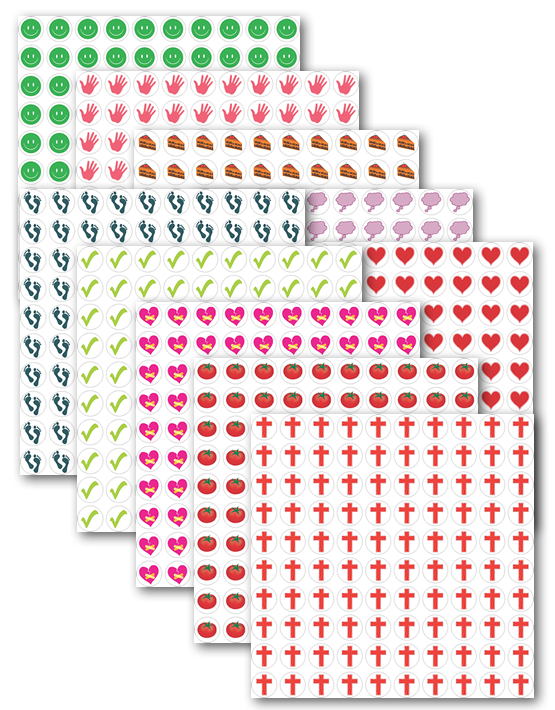 The school, church or family will have the opportunity to print the material itself. 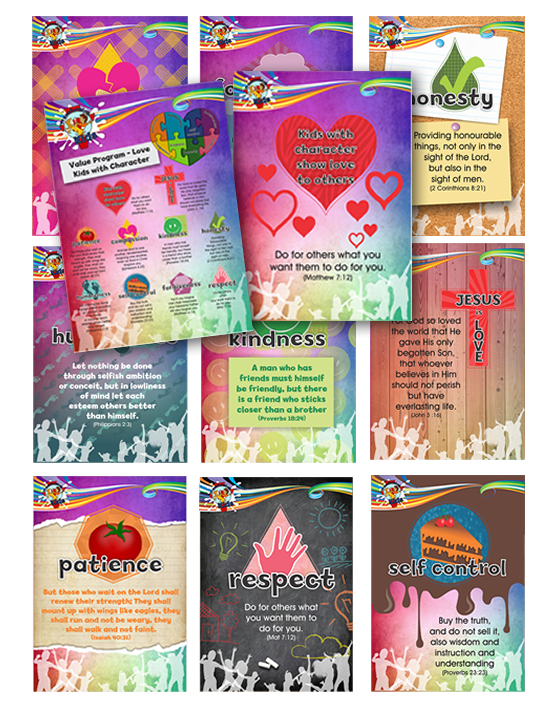 A complete manual will be available for each teacher to provide them with the necessary information on each key attribute of the love values (20 lessons). 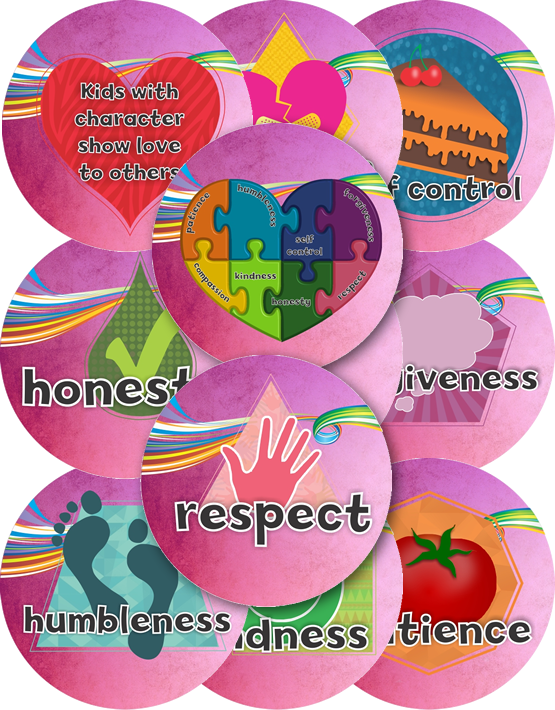 The values can also be used in the classroom, on the playground and in culture and sports activities. 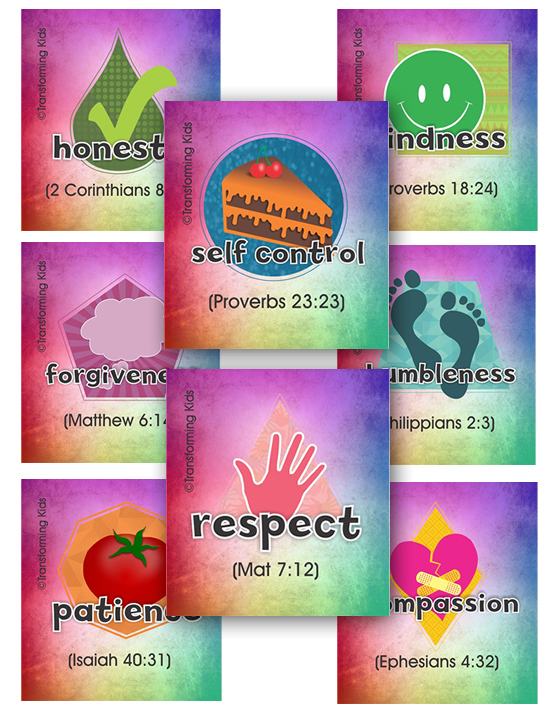 Schools, Churches and Ministries would have an option to buy for each classroom either 1 x A2 poster or a set of 8 x A3/4 posters to display in the classrooms. Children and parents would also be able to buys these posters or a smaller version A7 collection cards set and A7 fridge magnets. 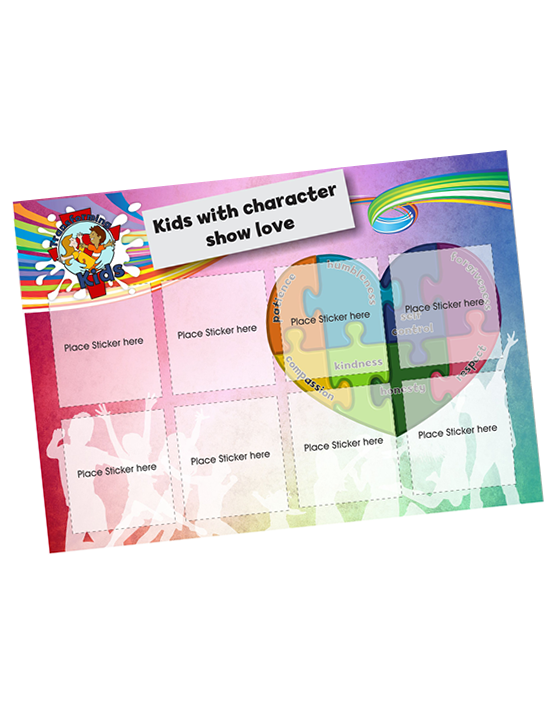 Schools, Churches and Parents would would buy a s ticker card for each child in the beginning if the year and 8 stickers occasionally when the different values are presented to add to their sticker card, to help them remember the values. The sticker cards and stickers may also be sold separately to children and parents. 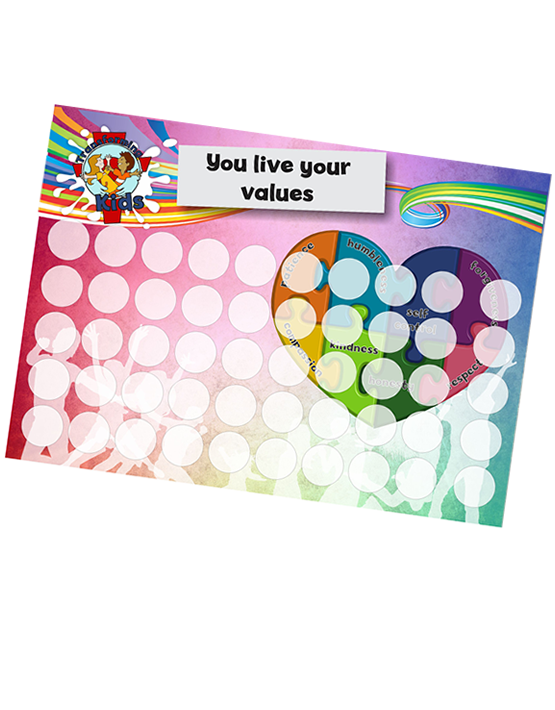 An A5 Motivational round sticker cards and round stickers are also available to buy for teachers and parents to motivate the children in the class or at home when they live out their values. Once the children reach a certain level of performance a final token of recognition is a bookmark or badge which are also available to buy. Once the children reach a certain level of performance a final token of recognition is a bookmark or badge which are also available to buy. We want to help the children to establish a lifestyle with moral values, to cultivate spiritual growth and spiritual transformation with the characteristics for the Love of God. God has entrusted us to the ministry of children and we sincerely believe that this program will assist all our partners in God’s movement.